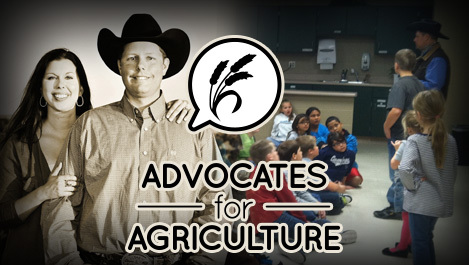 Troy and Stacy Hadrick are pioneers in the agricultural advocacy movement. They have traveled the world helping people involved in agriculture find their voice and confidence to share their story. Troy and Stacy know first hand how busy people in agriculture are. They farm and ranch in North Central South Dakota with Troy’s family. They believe that connecting with someone about agriculture should be on everyone’s chore list everyday! Troy and Stacy have reached many people with their positive message of agriculture. They would love to be the next speakers at an event you have. Their message with inspire people to take action and get out and do something to share the positive story of agriculture. Troy & Stacy Hadrick are passionate about agriculture. They both grew up on farming and ranching operations in South Dakota and have roots in American agriculture that go back several generations. In fact, the common bond of agriculture is how they first met as teenagers. In 1998, they graduated from South Dakota State University, Stacy with a B.S. in Ag Econ and Ag Business degrees and Troy with a B.S. in Animal Science. They returned to ranch with Stacy’s family in western South Dakota on a cow/calf operation. Right away, Troy and Stacy became active in Farm Bureau’s Young Farmers and Ranchers program. They were able to expand their leadership experiences and talent for speaking in front of people. Being a leader in agriculture is not an easy job, especially when you are younger and trying to get started in agriculture. Troy & Stacy took advantage of some fantastic opportunity to expand their knowledge of agriculture and saw the need to become advocates for agriculture. Troy and Stacy realized right off the bat that the best way to combat negativity toward agriculture was to stand up and tell your own story. No one can dispute your story. It is Yours. But for far too long, those of us in agriculture have been letting someone else do the talking for us. They also realized that they can’t do it all themselves. In 2006, Troy and Stacy decided that they needed to share the importance of standing u p and telling the story of agriculture with producers. What started out as a 25 minute speech at the South Dakota Women in Agriculture Conference has evolved into Advocates for Agriculture. Word traveled fast about this young couple in South Dakota and soon they were being asked to speak to locations across the United States, Australia and Canada. Troy and Stacy know first hand how busy producers are, so every presentation gives them tools they can use on a daily basis and the motivation to stand up and tell their own story. Although there is a long fight ahead of us, those who are using Troy and Stacy’s techniques are seeing amazing results and having fun doing it! They are active in South Dakota Farm Bureau and the South Dakota Cattlemen’s Association. Through Farm Bureau, Troy and Stacy have both won the State Discussion Meet and as couple they won the State Excellence in Agriculture Award. In 2004, they were awarded the National Excellence in Agriculture Award from the American Farm Bureau Federation. Because of these awards, both Troy and Stacy were chosen to participant in Farm Bureau’s most prestigious leadership training program, Partners in Agricultural Leadership (PAL). In 2010 the Hadrick’s were chosen by BEEF Magazine as their Trailblazer Award winners. Troy and Stacy farm and ranch in North Central South Dakota with Troy’s family where they raise cattle, corn, soybeans and wheat. The Hadrick’s have three children, Teigen, Olivia and Reese.